↑ Magnier, Mark; Sharma, Subhash (27 November 2008). 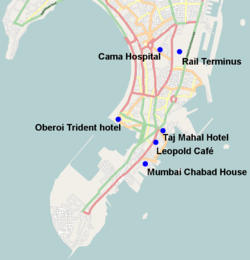 "India terrorist attacks leave at least 101 dead in Mumbai". Los Angeles Times. p. A1. Retrieved 28 November 2008. ↑ Masood, Salman (2009-02-12). "Pakistan Announces Arrests for Mumbai Attacks". New York Times. Retrieved 2009-02-12. ↑ Haider, Kamran (2009-02-12). "Pakistan says it arrests Mumbai attack plotters". Reuters. Retrieved 2009-02-12. ↑ Pakistan admits Pakistanis, LeT training camps used for Mumbai attacks. The News Tribe (2012-11-12). Retrieved on 2014-06-19. ↑ Nelson, Dean. (2009-07-08) Pakistani president Asif Zardari admits creating terrorist groups. Telegraph. Retrieved on 2014-06-19. ↑ Pakistan admits Mumbai terror link | The National. Thenational.ae (2009-02-12). Retrieved on 2014-06-19.